Understand if a central / state government employee can become a trustee in a public charitable trust. Here we are explaining various relevant laws associated with this topic. “Dear Lalit ji, can a government employee become a trustee?”, it’s a question that has often been asked by my readers who are government employees and want to engage in social work. 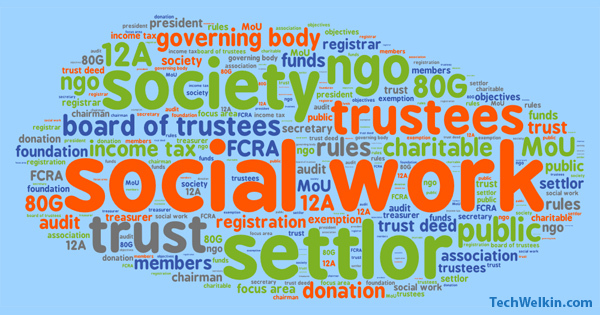 I have written several articles on how to register a public charitable trust and a society. I have been thinking of answering this question since long and today I am actually going to do so! Before actually hovering around the moot question, it is important to understand what is the meaning of government employee in the eyes of law. The definition of government employee under various statutes and laws is very different from our day-to-day interpretation. While we consider the term for every employee who is directly or indirectly working under the Central/State governments, the law first and foremost only defines the term “government servant” and it further restricts the definition to specifically defined categories. While the term government servant is clearly defined, the term government employee has not clear definition in the statutes. For example, under the Central Services (Conduct) Rules, 1964 government servant means any person appointed by the Union Government to any civil service or post in connection with the affairs of the Union and includes a civilian in a Defense Service. While the above Rules are applicable to the Central Civil Services, each state also has its own state services conduct rules. So, any employee working for the central/state government but not falling under the ambit of this definition need not worry at the very outset as she certainly has no bar or restriction from her employment with the government. Now coming to the main topic, you know by now through my previous articles that the trusts in India are governed by the Indian Trusts Act, 1882. The Indian Trusts Act is silent on the status of a government employee as far as the role of trustee is concerned. Position of a trustee holds a lot of significance because of the well-established fiduciary relationship that exist between beneficiaries of trust and the trustee. Thus, the Indian Trusts Act leaves no loopholes in ensuring that the essence of such a relationship is kept intact. In my article on NRI as a trustee, I have already explained that there are two critical sections under the Indian Trust Act which clarify the eligibility of a trustee. Section 10 deals with the eligibility criteria of a trustee. It clearly states that a person capable of holding a property can become a trustee. However, where the trust is subject to exercise of discretion, such a person must be competent to contract. Any government servant would easily be able to fulfill these two conditions. Once the eligibility criteria under section 10 are fulfilled, the only glitch that remains is the categorization mentioned under the Section 60. Wherein Section 10 directly determines the eligibility of a trustee, Section 60 indirectly poses a bar on the person(s) falling under certain categories by classifying them as person(s) not proper to become a trustee. A person who is having domicile of any foreign country. A person having an interest inconsistent with that of beneficiary. A person in insolvent circumstances. A married woman and a minor, unless the personal law of the beneficiary allows otherwise. In most likely circumstances a government employee would be directly fulfilling four out of five classifications since a government employee cannot be a person domiciled abroad and neither can he/she be an alien enemy. Further he/she cannot marry a minor and he/she cannot be a person in insolvent circumstances otherwise it would altogether lead to termination of his/her employment as a government employee. The only criterion that has to be ensured is whether he/she is a person having an interest inconsistent with that of the beneficiary. Even the last criterion does not pose any explicit bar from becoming a trustee. It is rather an anticipatory clause. So, after thoroughly addressing each clause, it is pretty evident that the classification under Section 60 would hardly act as a barrier in way of a government employee from becoming a trustee. So, can a government employee become a trustee? you should make sure that the NGO is not engaged in activities that are against the government’s policies or government’s stand on issues concerned. You wouldn’t want to appear against the government or otherwise you may face disciplinary action. It could be safely conclude that a government employee can become a trustee. The mere fact of being employed by the State/Central Government does not bar someone from becoming a trustee of a Public Charitable Trust. Hope this article helped you in getting a clear picture on the present topic. In case of any doubt, feel free to comment! Last updated: 22 September 2017 | Published on: 31 March 2016 | Authored and Edited by: Lalit Kumar and Team | Filed as: Home » Career and Personal Development » Can a Government Employee Become a Trustee? Can a corporate employee be a settler of a trust ie start a trust? For a government employee, is it necessary to take permission to become a Trustee in a public trust? Is it sufficient that the government is aware that he is a member or office bearer of a Public Trust? Does a government employee requires to take government permission to accept a post of a trustee in a public trust? I am a government of India Enterprise servant. ONGC,within Thirty Seven years.i will be running from my service. I work to promote Hindi Bengali Temple Ankles war Gujarat. Not a Trust member, but Trust member decide Temple new Bank A/C open, then Ten people name submit and three member signature of withdraw. ONGC, Enterprise Kolkata Vigilance section blame me. Not a Permeation your office ( notice). 3.Before Bank A/C of Trust, would I have to take permission from my Department ? Please send reply to our email also. 1. How much amount require to register an educational trust. 2. To whom I need to go for this registration process. Sir, I am a Grp A gazetted officer in Central Govt. Can I start an NGO in the field of education? Thanks Sir, it is very useful information. Sir I am a contractual state government employee in the state of Assam. I don’t have land or other property in my name. I want to form a charitable trust. Is it possible? my friend had registered trust with his husband in 2002 in kolkata and was running it good but after the death of his husband in 2008 she stopped doing anything as was not in condition to work even she moved from kolkata to madhya pradesh where her mother resides. now she wants to continue this trust and do social work through it. what is the formaility to restart this trust in madhya pradesh ? is there any formality, reregistration etc required? We have a society registered under Society Act. We want to file return of Income Tax. In the process of registration of society on income tax portal, what would be the type of user? I can see options of Individual, HUF, Company, Body of individuals, Firm, Trust, Association of Persons, etc. I am not sure what option I should choose? Well, you should engage a CA to do this. In any case you would need a certified CA to audit the accounts of your society. Give the whole work of auditing and filing return to a qualified CA. Hello, sir, you are doing great work to the society. We, a group of 22 friends, have been doing a charitable activity in Trivandrum, Kerala for the past One year by collecting a small amount per head and donating to the needy and poor in the society. The amount is being collected in a common bank account till date. Now we propose to start a Charitable Trust and expand the activities by inducting more like minded members. In this case, please clarify the following. 1. If we register a trust, should we apply for a PAN card compulsorily. If yes, whether our accounts need be audited compulsorily? 2. It is understood that the Trust Deed is to be registered in the local SRO. What are the other registration processes? If you want to receive donations and want to apply for 80G/12A certificates, you will have to apply for a PAN number for your trust. kindly clarify on the point 5 , under conditions for ineligible people mentioned in the article. Married women are not eligible to be trustees? A married woman can become a trustee. The point number 5 says that if the personal law of that woman forbids her from becoming a trustee then she can not become a trustee. The Act itself does not bar any married woman from becoming a trustee. I feel delighted to go through the useful topics by TECHWELKiN. really it enlightens a lay man like me . 2. I have my own land. but I want Financial support from Central Government and State Government also for better work for society. 3. Before registration of Trust, would I have to take permission from my Department? 3. It is better that you inform your department that you’re going to be the settlor of a charitable trust.